We live in turbulent times. This month marks the 10th anniversary of the Hurricane Katrina disaster which killed 1,833 people and caused an estimated $108 billion in damage. In the decade since Hurricane Katrina we have seen natural disasters bring death and destruction across the world with the Kashmir earthquake, Pakistan (est. death toll 79,000), Cyclone Nargis, Burma (est. death toll 138,000), the Sichuan earthquake, China (est. death toll 90,000), the Haiti earthquake (est. death toll 220,000), Japan earthquake, resulting tsunami, and Fukushima nuclear disaster (est. death toll 19,300), just to name a few. When the next disaster strikes, will you be ready?? This is #1 because the rest of the tips will be useless if you panic during the emergency and toss out the plans you made while thinking clearly. The pugilist Mike Tyson said “everyone has a plan until they get punched in the mouth.” This is true of disaster preparedness as well as boxing. Don’t let this happen to you or your family. Boxers scrap their plan because they panic once that first hard right cross hits them. Understand that things will be chaotic in an emergency; be the one person who keeps their head when all about are losing theirs. Understanding the risks you face is important to making proper preparations. Some things are obvious, earthquakes in California, tornadoes in tornado alley, hurricanes along coastal areas etc. ; some are not so readily identifiable. The New Madrid Fault line in the Midwest is one we don’t hear a lot about, but a major quake would likely affect at least Illinois, Indiana, Arkansas, Kentucky, Missouri, Mississippi, and Tennessee. An earthquake on this fault line in 1812 was strong enough to cause the Mississippi to reverse course for a period. The area was sparsely populated at the time, but a similar quake today would likely cause catastrophic damage. As with all fault lines, pressure is building and it’s just a matter of time before another major quake occurs. A little research into the natural disaster threats facing your part of the country can better prepare you for future disasters. 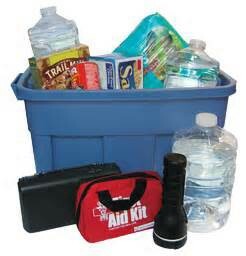 Make a disaster supplies kit; a kit should include basic items you and your family will need during an emergency. You may be required to evacuate with little or no notice and will probably not have time to gather or shop for the supplies you need. Build your kit to ensure you have enough food, water, and other supplies to last for at least 72 hours, preferably a week. First responders cannot reach everyone immediately. Depending on the severity of the disaster, help could arrive quickly or it might take several days. It is possible your family will not be co-located when a disaster occurs; a communication plan details how you will communicate with one another during the initial chaos of a disaster. 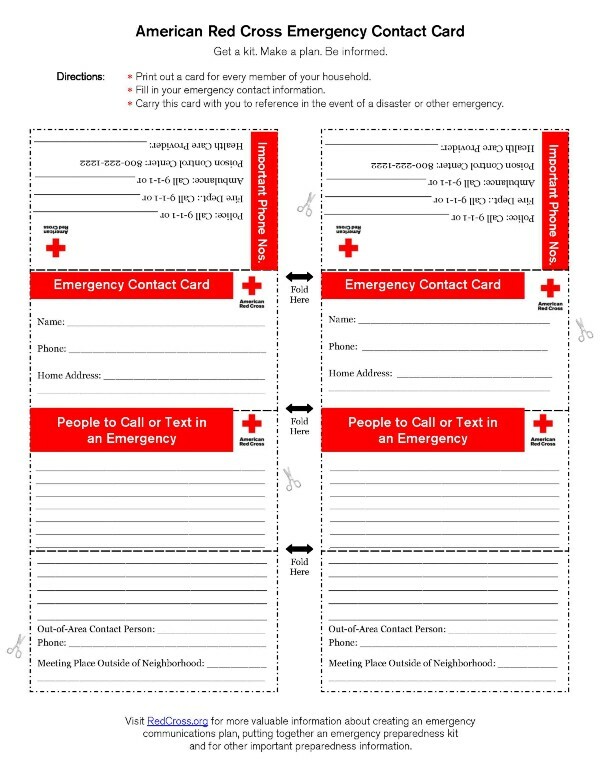 Fill out a contact card for each family member; both electronic and hard copy. Keep these hard copy cards readily accessible for all family members including children. Check with your child’s school or day care as these facilities should each have emergency plans in place. Make sure they have your emergency contact information and several methods/numbers to reach you or another adult emergency contact. Identify a friend/relative living outside your region as an emergency contact for your family members to notify they are safe, or otherwise. During an emergency, cell phone towers become inundated with traffic as people attempt to access the network simultaneously. Therefore, it may be easier to connect a long distance call than to reach someone within the same area code. Thus an out of region contact will likely have more success relaying messages among separated family members. Additionally, text messages often get through despite congested network disruptions when a phone call would fail; however, depending on the type of disaster, cell phone towers may have sustained damage as well, in which case cell phones may also be unusable. Simply put, don’t be stupid. Evacuate when evacuation orders are given. This is a simple but effective way to stay alive. It seems reasonable for most people; however, there are those who ignore evacuation orders and choose to “ride out the storm” or whatever the emergency may be. These people are the ones first responders later have to risk their own lives to save; don’t endanger the lives of others due to the “inconvenience” of evacuation. DO NOT become complacent. Many areas receive frequent evacuation orders; people become complacent when the storm or emergency doesn’t turn out to be “that bad” or they ride out the storm without incident. 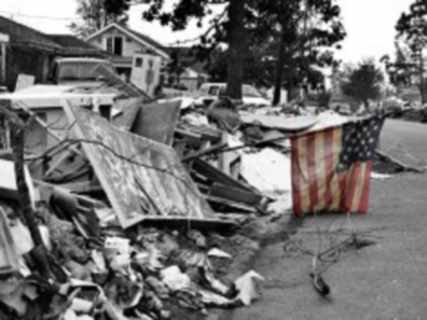 This complacency may cause some to ignore the next evacuation order; this type of complacency contributed to the death of many people during and in the aftermath of Hurricane Katrina. Many communities have automated systems that push text or e-mail alerts to inform subscribers about important emergency information. Know your neighbors. Years ago this tip may not have been necessary. Today, many of our communities have become fractured to the point many of us do not know our next door neighbors. Unfortunately this breaks down a community’s cohesion and resiliency in time of disaster. Get to know your neighbors; identify those who may need an extra helping hand (elderly, disabled etc.) during an emergency. Plan to check up on your neighbors and assist them as well. Encourage others in the community to have preparedness plans for a disaster; understand though, you and your family may be the only ones prepared. Be a good neighbor, and plan to help those in your community as able. For most of us, our pets are part of the family. The chances your pet survives the next disaster is dependent on your emergency planning now. When evacuating, take your pets with you! Most of our pets will not survive without us, and if they do, it is doubtful we can find them upon our return home. Every major disaster leaves hundreds or thousands of displaced pets. Additionally, most public shelters have a “no pets allowed” policy. This necessitates making an alternate shelter plan for you and your pets. Develop a plan with family or friends outside of your local area who would be willing and able to let you and/or your pets stay during an emergency.Develop an alternate plan in the event you cannot take care of or evacuate your pets yourself. Work with other animal lovers in your network to ensure someone will care for and evacuate you furry friends in your stead. Practice makes perfect. Periodically walk through or at least talk through the steps each family member will take in the event of emergency. This will certainly not be the highlight of anyone’s year, but it may be the difference in surviving a disaster and becoming a statistic. Volunteers are an essential element to disaster preparedness and there are many ways to get involved in your community. Find a program that works for you and be a part of the solution to your community’s preparedness problem.